Socia, 58, has improved GM's relations with its supply chain. DETROIT -- General Motors has appointed global purchasing chief Bob Socia as president of GM China, succeeding the retiring Kevin Wale, effective Oct. 1. Wale, 57, became president of GM China in 2005, growing sales from 560,000 units that year to 2.5 million in 2011 -- making China GM's largest market. The move marks Socia's second stint in China. He served as executive vice president of Shanghai GM from 2007 to 2009, when he was appointed GM's vice president of global purchasing and supply chain. The job also includes heading up operations in India and several other countries in Southeast Asia such as Indonesia and Thailand. Socia, 58, has improved GM's relations with its supply chain. In this year's annual ranking of automakers' supplier relations by Planning Perspectives Inc., GM received its highest-ever ranking. Its score has improved every year since Socia became purchasing chief, replacing the departing Bo Andersson. GM, in a statement, said it would name Socia's successor "in the near future." It's the latest in a string of executive changes under CEO Dan Akerson. So far this year, Akerson has installed new heads of manufacturing, information technology, infotainment and GM Europe, while also dismissing his global marketing chief, Joel Ewanick. Socia has held several other senior positions overseas. He was president of GM South Africa in 2004 and has served in executive roles in Asia, Europe and South America. Socia will report to Tim Lee, GM's vice president of global manufacturing and president of its international operations, which includes China. "Bob has extensive experience leading global operations and global purchasing, and working directly with our joint venture partners," Lee said in a statement. Wale began his career at GM's Holden unit in Australia in 1975. 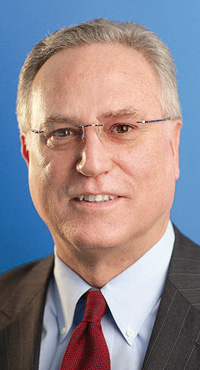 In 1998, he was named head of GM's Asia-Pacific operations, and in 2001 became managing director of GM's Vauxhall brand in the U.K. and vice president of GM Europe. "Kevin has been instrumental in strengthening our foundation in the largest vehicle market in the world," Lee said. "We appreciate Kevin's nearly four decades of service to the company and wish him continued success."